Black Swan Events (2011) 16 min. *This piece has not yet been performed in public. Directed by Brandon Hunt and Taylor Rankin. Edited by Brandon Hunt (http://mediavandal.com). Electric guitar cadenza was composed in collaboration with Victor Dods. Produced and recorded by Nick Vasallo. Mixed and mastered by Zack Ohren. I seldom name a work before composing it but the discovery of Nassim Nicholas Taleb’s concept of the “black swan” inspired me to structure the entire work around this central idea. Based upon Taleb’s criteria, a “black swan event” is a surprise to the observer, has a major impact, and is rationalized in hindsight – as if it could have been expected (e.g., the relevant data [was] available but not accounted for). One of my primary goals with Black Swan Events was to create an environment where two worlds collide and become one. I wanted to treat the appearance of Heavy Metal (“metal”) as a surprising event that has a major impact upon the structure of the work. By the end of Black Swan Events, the world of “metal” – represented by the electric guitar and drums –becomes so prevalent and enmeshed within the orchestra that its initial arrival, in hindsight, no longer seems surprising. The relationship between these two worlds – metal and western art music – transforms from instability to resolution and synthesis. Composers strive to find their own distinct voices and most of these composers, consciously or unconsciously, want their voices to ‘speak’ through their music. The unifying principle in Black Swan Events takes this idea literally. Using experimental software to analyze the spectrum of my extreme metal scream, I developed chords that modeled the scream’s spectrum. I wanted a conceptual relationship to exist between my voice and all of the musical materials in Black Swan Events so that every note is, conceptually, a remnant of my scream. Essentially, I used a spectral-matching orchestrational tool to duplicate the spectrum of my scream and with this solution I built a chord. The primary motivic materials of the piece were built from the collection abstracted from the original spectral data. I also collaborated heavily with Victor Dods, the original guitarist for this work, and incorporated his musical input into the collection of motifs. These motifs play an essential unifying role in Black Swan Events. While metal is the first and primary black swan event, the piece incorporates several others. I will demonstrate how polystylist and eclecticist philosophies interact in Black Swan Events to produce a highly pluralistic yet unified work, creating a music both alluding to and drawing upon the experience of other genres – born out of personal practice. 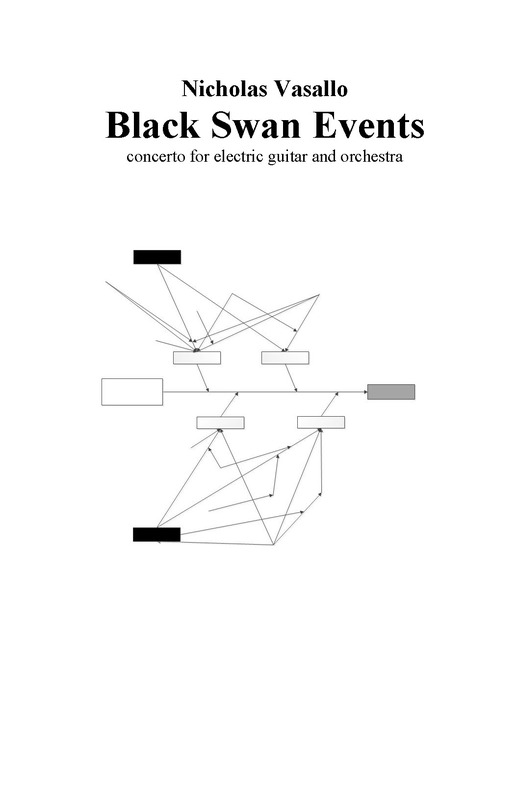 References and allusions to Neurosis, George Crumb, J.S. Bach, Kanye West, Eddie Van Halen, Stravinksy, Ligeti, Beethoven, and spectralism abound in Black Swan Events. It is my intention to illustrate how my own style functions within the ongoing dialogue of these disparate sources of music.